The "no-splurge" attitude of consumers has continued despite a rise in UK shopper numbers last month, a survey has suggested. "We continue to be in the midst of a no-splurge culture," said Springboard. Diane Wehrle, insights director at Springboard, said shoppers remained focused on "prudence". "This becomes very obvious when looking at footfall in each week; with the month being bookended by two strong weeks, while footfall plunged in the middle three weeks," she added. 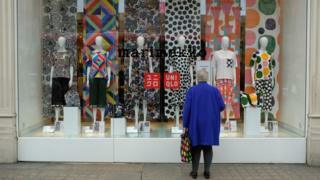 Helen Dickinson, chief executive of the BRC, said: "Retailers will be relieved to see footfall up from last year though this is was heavily influenced by the weather: while shoppers in 2018 were contending with the 'Beast from the East', this March has been mild by comparison. The increasing popularity of online shopping, higher business rates, rising labour costs and the fall in the pound following the Brexit vote - which has increased the cost of imported goods - have all been blamed for contributing to retailers' woes.